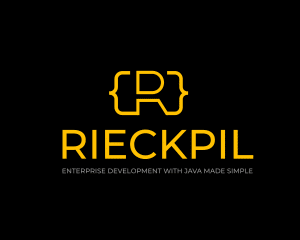 As a Java/Jakarta EE developer, we can rely on the javax standards to work on every certified application server in the same way. When it comes to managing the application server, every vendor has a different and proprietary API for managing its resources. To use a different application server you first have to get comfortable with its CLI and config files. 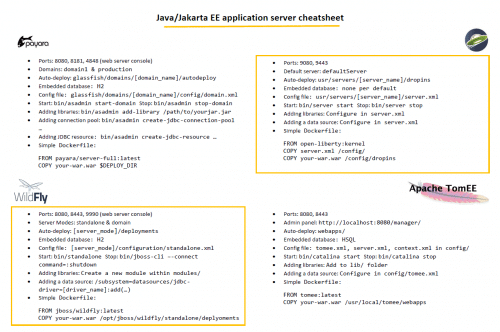 To provide you a faster learning curve for a new application server, I’ve created a #CHEATSHEET for every major Java/Jakarta EE application server (Payara, Open Liberty, WildFly and TomEE). With this cheat sheet, you will have a reference for starting/stopping the server, finding relevant logs files, getting general server information, customizing the server configuration, adding custom libraries and creating a JDBC data source with PostgreSQL as an example. # docker build -t mypayaraapp . # docker build -t myopenlibertyapp . # docker build -t mywildflyapp . # docker build -t mytomeeapp . Want to have this cheatsheet always at hand as a nice PDF? Subscribe to my newsletter and get it for free.